Update from MDP student Adriana Arce Martinez: "During the first month of my field experience in Punta Gorda - Belize I have had the opportunity to learn a lot about the Maya culture and the economic local context of Toledo District. 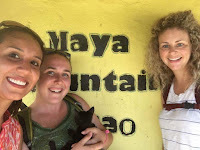 My team (MDP students Adriana Arce Martinez, Erin Ntalo and Julia Fair) has been doing visits and interviews to different economic actors, organizations and community members that are involved and immersed in the development process of a Maya economy. Among all the businesses and organizations we visited so far, I was highly interested in the management, production, and commercialization of cacao. Local cacao consumption does not generate enough returns to producers because local consumers are not willing to pay higher prices, therefore, most of the chocolate and roasted cacao seeds are exported. One of the major challenges we identified through our interviews is the lack of cooperation and shared goals of the actors in this industry. While some of them are seeking for sustainable cacao development, others’ priorities are short-term returns and very low production costs. There is a significant need of technical support and training to farmers in order to increase their bargaining power and improve their position as negotiators. Having this type of conversations is very useful for my team as it helps us get a better idea of the economic context in this part of the country. Understanding the challenges and success paths of the local actors is essential to start building a vision for the Maya people of Belize." 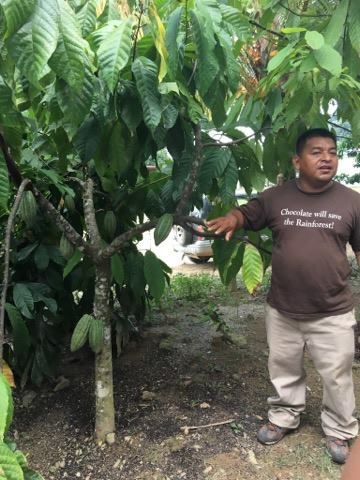 Pictured: (left) Juan Cho --Owner of IXCACAO Maya Belizean Chocolate-- telling history of cacao in Maya culture and showing the first cacao tree from which he started his business and (right) the MDP Belize Team. Photos posted with permission.